Applying Wood floor repair and timber restoration to chips, scratches, dents, split timber, stains, all items repaired on site at a time that is convenient for you as we are available to work through weekends and afternoons. Our technicians firstly remove any loose material left surrounding the damaged area, then fill the damaged area with a strong durable filler which must be smoothed and profiled to match the existing floor. After the area has been profiled the area is ready to be grained, graining in a area firstly covers the filler and then match the graining of the original wood work blending in the surface leaving it unnoticeable to the eye. The next step is to cover the repaired area with a tough 2 k lacquer to ensure the repair is water tight and protected from various things that could damage it. 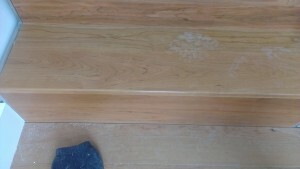 A great reason to have a floor repairing service rather then replacing damaged timber is simply it easier to restore then to replace, as pictured below a split cherry wood tread of a stair case would have required masses of man hours. The majority of the staircase would have to have been replaced, simply due to a split in the timber, other items that could also be damaged include the plaster work to the wall and the rest of the stair case, to replace a staircase would have cost thousands. 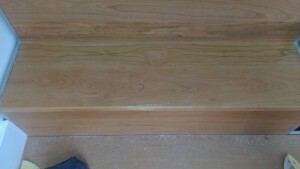 Below we have a solid cherry wood staircase that had been badly damaged after it had been installed, the tread of the staircase had been split half way along the front edge of the riser, it was a simple job for our technician to repair and it was finished in no time at all. There was other repairs that had to be made to the cherry wood floor and staircase, our technician was on site for the duration of the day which worked out to be a bargain compared to the price of replacing the entire timber floor and staircase.